Since 2004, SoyWorld, USA Inc. has been dedicated to the development of environmentally safe products for beauty, home and health using one of nature’s most powerful ingredients, the soybean. Magic of Soy’s purpose is to educate readers about the benefits of soy in our specialities: the skin care and household product markets. We know that soy is often thought of as a food, but it’s so much more. We also offer information about eco friendly living. We hope you find this blog useful. Our patented process takes whole soybeans and turns them into micro particles that break up dirt, grime and bacteria at incredibly high speeds. Our biodegradable products are gentle on the environment and help other oils and acids decompose in the water systems of the world. 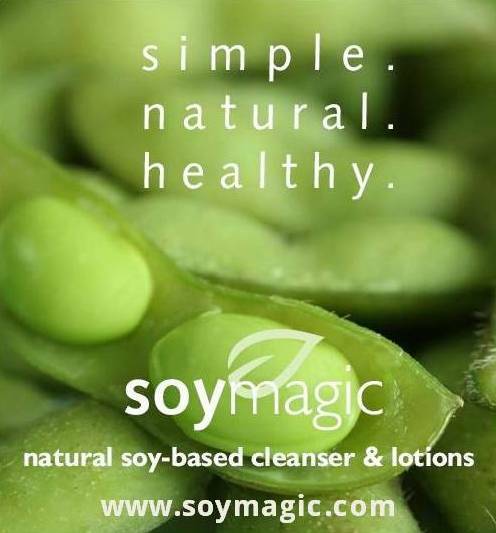 Our natural skin care line includes SoyMagic Skin Cleanser, SoyMagic Body Lotion, and SoyMagic Facial Lotion. Our household products include SoyComplete All Purpose Cleanser, SoyShine Dish & Tableware Cleanser, and SoyFresh Fruit & Vegetable Wash. We also feature SoyGolf, a golf club cleanser. Future product development includes a laundry detergent and an automatic dish washing machine cleanser. SoyWo rld USA is also a proud member of the Green Business Bureau, an organization devoted to fostering environmental awareness among businesses and promote business practices that are environmentally responsible. More information about our products and an online store are available at SoyMagic.com or by calling 888-769-6242.